The Pirates of the Caribbean franchise has an odd place in my heart that is directly tied to 7th Sea, oddly enough. I was introduced to both during my first semester at college, at close to the same time; 7th Sea was handed to me by my fencing senpai while Pirates of the Caribbean was the first movie I manned the film projectors for that same semester just a few weeks later. It’s no small wonder that I put these two franchises together and run with it, and every time a new Pirates film comes out, I get the itch to run a game of 7th Sea again because of it. Pirates of the Caribbean: Dead Men Tell No Tales is the fifth movies of the franchise. 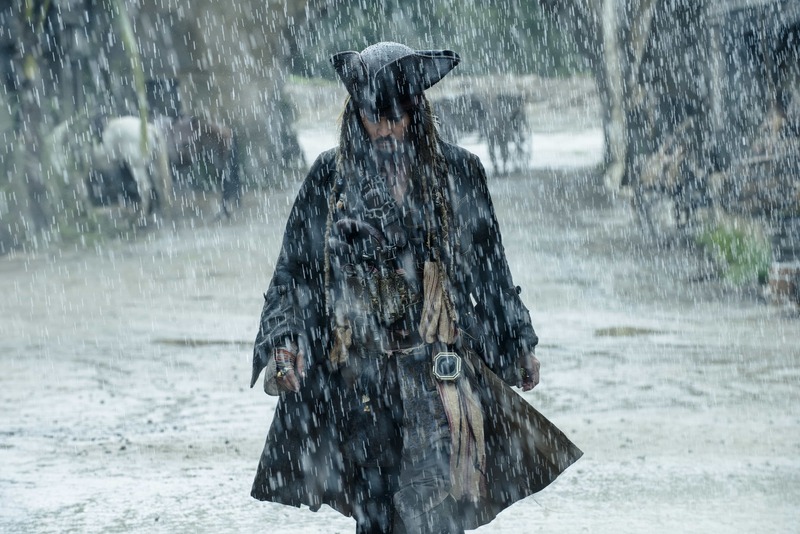 The pitch sums up to Captain Salazar, now a ghost, is out seeking revenge against Captain Jack Sparrow, who is having his own complications (as per the usual). The film clocks in at two hours and thirty-three minutes (sixteen less than At World’s End, sixteen more than it’s predecessor On Stranger Tides, and ten more than Curse of the Black Pearl). Johnny Depp returns to the role of Captain Jack Sparrow, and we also see a number of returning faces (Gibbs, Barbosa, and other members of the crew) as well as new faces (Will and Elizabeth’s son, an unknown orphaned woman, and Captain Salazar). It’s a fast-paced story of revenge, curses, and of course, piratical hijinks. Unlike On Stranger Tides, we have a return of some of the music that made the Pirates of the Caribbean franchise famous and, quite frankly, iconic. Watching a Pirates film without that iconic score just feels off, and having some of those elements return made me feel right at home. Of the all characters in the film, I have to say that two new characters of the film stole the show for me and really were excellent additions to the franchise: Carina Smyth and Captain Salazar. Smyth gives us a strong female role in terms of force of will and willingness to shake the societal standards, and proves that brains are just as, if not more important, than steel and guns. Salazar, on the other hand, was just an ideal villain: cutthroat, creepy, powerful, and had a commanding presence whenever he was on the screen. And I don’t think it’s just the CGI. Like the films before it, the special effects and general cinematography were spot on, from a ship battle in a storm to the way the curses are portrayed, even down to how many of the ships looked were excellent. There were times it was obviously a real person in CGI scenario, but overall it was an enjoyable experience. Like many Pirates films, I found a number of elements of the film to be inspirational for swashbuckling games. It’s hard to talk about the scenes without spoiling them, but there’s some idea fodder that I can see myself using at the gaming table whenever games pick up. I’ll be upfront, there are a large number of problems with the film, and I hate that I have to say that. Yes, this is how I feel saying that. My first issue is the whole bit of recycling. Many elements of this film are, quite frankly, pulled directly from the first Pirates film, with nods to the rest of the franchise. Unsinkable cursed ship with an immortal, partly incorporeal crew? Check. Magical McGuffin that’ll remove the curse? Check. Characters being thrust into situations because of their respective parents that they didn’t get a chance to get to know? Check. Said characters inheriting things that impact the quest? Check. Beasties that work for the villain being used to chase down Captain Jack Sparrow? Check. Secret and hidden location that can only be found with a special map and/or an astrological occurrence? Check. Young man who is not a pirate mucking his way through things? Check. Young, educated woman being thrust into the world of pirates and supernatural things? Check. Lots of rum drinking and falling asleep because of said drinking? Check. It’s almost like the writers were running out of ideas and decided to just take a large chunk of the elements of the first movie, add in elements of the later films, and throw them together into a “new” movie. The rehashing is pretty brutal and obvious. Second issue is actually a bit of a continuity problem for me…or rather, multiples. You see, Dead Men Tell No Tales supposedly gives us the origins of the Pearl as well as parts of Jack’s past (and how he crossed Salazar), but in previous movies we are told about how he gets the compass (hint: they don’t match). We see a character potentially return (or at least a hint), but everything leading up to that point literally shows that this is an impossibility. We are told that Salazar almost saw an end to pirates himself decades ago, yet the Pirate Kings have been around for hundreds of years (and some of them looked rather ancient). There’s a hint that Will Turner is starting to get the same curse as Davey Jones, but we aren’t shown why (as that curse was due to him not doing his duty). We get a number of points like this where things just suddenly happen or appear even though there is no logical reason for it if you’ve been paying attention to the franchise. I hate when things like that happen. Third, there’s my biggest, multi-point complaint: some of the writing was just…horrible. For example, in most of the Pirates franchise, we are used to having witty banter sporadically through the film, especially the great one-liners, as well as having moments of Jack delivering elaborate sentences that show that he’s not a blundering buffoon but rather someone who can trick people into what he wants. In Dead Men Tell No Tales, we had certain elements of those witty exchanges, but they felt too localized; there would be a scene of them, but then the next scene or two would fall flat with any attempt at a joke delivery. Jack had one attempt at one of his sentences, but it was poorly done, and there was little to no snarky commentary between him and Salazar, which is something audiences would have expected. This is also true for the general use of some of the scenes. Some of the scenes were perfect Pirates fluff, such as the bank robbery and the ship battle, but others, like a specific wedding scene, were just tossed in and did next to nothing for the plot, pacing, or even the comedy. Honestly, some parts of the movie could have been cut almost altogether and, outside of a minor detail or two that could have been better explained in another fashion, the movie would have been better for it. There were also a number of elements of the film that were completely underutilized or not utilized at all. One of the biggest underutilized elements, honestly, was the actual cast. The story pulls away from Captain Jack, almost like the franchise (should it continue) will no longer be about him (yet there were hints at the end that we could see more of his adventures). With that in mind, Jack’s activities were rather “meh” in comparison to previous films, lacking the sort of oomph we’ve grown to expect. Salazar was another majorly underutilized element of the film. Here we have this villain bound by honor, is immortal, is downright creepy, carries a commanding presence…and is regulated to second rate villain in the grand scheme of things. Even the new blood was regulated to a specific role but they were often inconsistent within it (to the point I was wondering if the characters were really set to their goals), making it hard to tell just what they were going to actually be doing. One of the gripes that came up in conversation was simple: why the HELL couldn’t we see a battle between the Silent Mary (Salazar’s ship) and the Flying Dutchman? We see how the Dutchman reacts to Henry Turner being in danger (granted, underwater and on the Dutchman itself), and there are many reasons why Will should know when his son is in danger, yet we do not see this clash of immortals or their immortal ships. That would have been a GREAT scene to film, even if it was just as a support moment, but alas, it was not given to us. In fact, there were MANY great potential scenes or other uses of previous plot elements (like how Barbossa is the captain of Queen Anne’s Revenge and hold’s Blackbeard’s Sword) that just weren’t used…and that saddened me greatly. All told, I’d personally give Pirates of the Caribbean: Dead Men Tell No Tales a middling 3 buns. I’ve been waffling between 2, 2.5, 3, and 3.5 because of the range of problems within the film and my emotional ties, so I went with the middle range. While there are some solid moments in the film, they are just that: moments. Said moments aren’t enough to make up for characters falling flat, inconsistencies in the storytelling, or a sloppy script. Still, the movie is a fun flick to catch, especially if you have enjoyed the previous films of the franchise, but to me, it’s no Curse of the Black Pearl. Pirates of the Caribbean: Dead Men Tell No Tales is currently showing in theaters as of this writing.